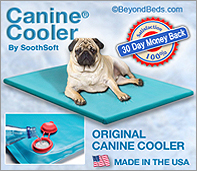 Looking for a great way to cool your dog this summer? Look no further, the Canine Cooler or the Cool Bed III™ are both cooling dog beds that do not require electricity to operate. Simply add the recommended amount of water through an easy fill cap one time. Both products have tremendous cooling power and have been on the market for many years. 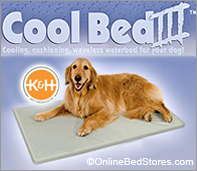 Please note some online retailers advertise these “dog cooling beds” as gel filled dog beds, the truth is these beds or mats do not contain any gel, the inner core consists of a water absorbing “sponge like foam” that feels very much like gel when properly filled with water. Cool Core diverts liquid for cooling, Available in 3 sizes, Two year limited warranty.